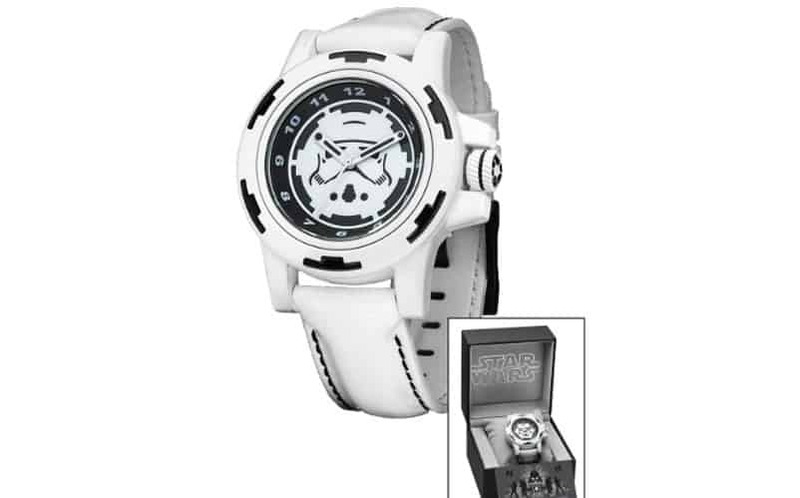 Star Wars Storm Trooper Collector Watch | Nerd Much? If you’re in the market for some Imperial Army accessories, this limited edition Star Wars watch is inspired by storm troopers. In fact, it’s likely that storm troopers actually wore this under their get-ups, but there’s no way to prove that. Why would a storm trooper wear a watch under their armor? Well, who knows, but this is one cool-looking watch. The Storm Trooper Collector Watch sports a storm trooper helmet right on the watch’s face, which is entirely plastered in black and white. It has a genuine leather band with a gloss finish and black stitching. It also has a black buckle clasp. The watch comes in a display case with a collector’s certificate as well as a serial number, so you know it’s a genuine licensed item. For more cool things to buy, stay tuned to Nerd Much. Check out more of the best Star Wars watches here.